Beautiful apartment for 4 persons next to the Palais des Festivals and beaches. 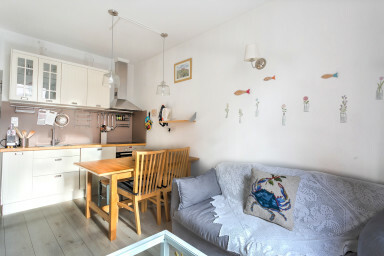 Charming 45m ² apartment, located in the heart of Cannes, just next to the Suquet historic quarter. It offers all the comfort for an exceptional stay in Cannes. Perfect for delegates (15 min walk from the Palais des Festivals) and for tourists (5 min walk from the beach). The living room / dining room with a flat screen and a South exposed and air conditioner. There is a bathroom and WC. Naturally, you will have free WiFi access in all the rooms and air conditioner, as well as all the amenities facilities to ensure your stay with comfort : sheets and towels of quality, an IMMOGROOM welcome pack (toilet paper, trash bags, etc. ), iron and ironing board, hair dryer, hangers, household equipment (vacuum, bucket, mop), as well as a washing-machine.